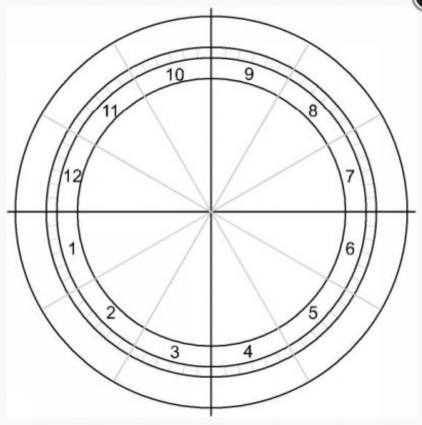 Our birth chart is a circle that is separated into 12 sections, kind of like slices of pie. Each slice represents an area of our life - these are called our “Houses”. Each house is ruled by a zodiac sign and there are 12 of those as well. Think of the signs as the vibe/characteristics/personality that color the houses and how you approach that area of your life. The signs are always in the same order for everyone’s chart (Aries, Taurus, Gemini, Cancer, Leo, Virgo, Libra, Scorpio, Sagittarius, Capricorn, Aquarius, Pisces) but your time of birth will dictate which sign starts your chart. The start to your chart is called your Rising Sign or Ascendant Sign. Your Rising Sign is the beginning of your 1st House which kicks off your natal birth chart wheel. The houses go counterclockwise from 1-12. So, if your rising sign is Cancer for example, then your chart will still keep the same order as I mentioned but start with Cancer (Cancer, Leo, Virgo, Libra, etc). Each sign is exactly 30 degrees long but some of our houses can be bigger or smaller then 30 degrees. Because of this, we can have a couple zodiac signs falling into one house. Even if there are a couple signs falling in a house, you always look to the sign that is at the beginning of the house (this is called the House Cusp) to see which sign “rules” that area of your life. The planets are all in specific signs in the sky when you are born. So, once you find out your Rising Sign, you can see what house in your natal chart that each of those planets fall in. This will bring those planet’s meanings into your houses. 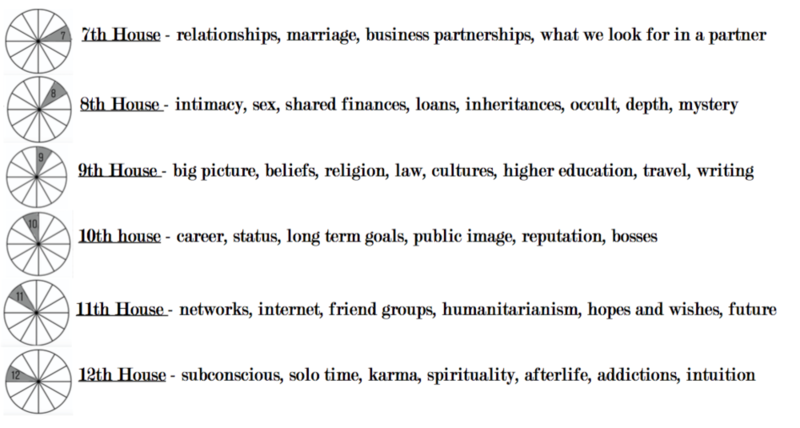 Each planet represents a specific part of our personality so finding our what area of life (what house) they fall in will be a big part of how we use that part of our personalities. While this post is focused on our natal charts, I have to mention that the houses are also very important for predicting events. Your natal chart never changes but the sky is always changing. So, you can take what is happening in the sky currently and line it up with your chart to see how the current sky is effecting you and where in your life (what house) you will be feeling their impacts and outcomes that can happen. These are called transits. More on those separately but this helps explain why each house has so many meanings - many of which may be strange to hear if simply interpreting our charts as our “make - up”. Newer PostWhere is this transit affecting you?